So, I had my date with the G6 and I liked it. I can't wait for our next time together. But it wasn't just me that liked it. The crowd of folks who attended Mobile World Congress also apparently did as they walked out of the event with 31 awards. 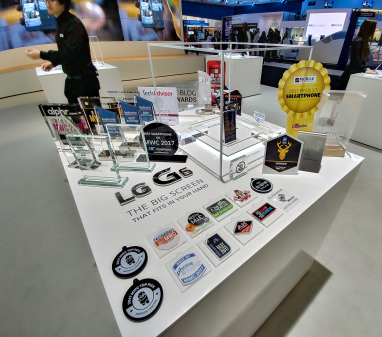 TORONTO ― LG Electronics’ G6 smartphone won an unprecedented 31 booth awards at Mobile World Congress (MWC) 2017, including multiple honours from various international titles and publications attending the show. The LG G6 demonstrates that the company is at the forefront of mobile communications and consumer demand. Amongst top honours received, Wired, Android Authority, Digital Trends, PCMag and TechRadar designated the G6 as the best smartphone of MWC 2017. The G6 was unveiled to more than 1,400 tech professionals prior to the main MWC event to high acclaim. The LG G6 delivers ergonomic excellence, a minimalist design and superb reliability. The G6 offers an expansive screen and immersive viewing experience with its 18:9 screen aspect ratio and 5.7-inch FullVision display. Thanks to the unique ratio of the screen and its smaller body, customers can easily and comfortably use the G6 with one hand. Dual 13MP rear cameras let users capture the shots they want with standard and wide angle lenses. What’s more, the smartphone has been tested to the highest standards with reliability and durability in mind.